Roscoe is a 12-year-old, neutered male Poodle who was originally presented in September 2017 for having urinary accidents in the house, straining to urinate, and increased frequency of urination. His physical examination was unremarkable except for having a large bladder. 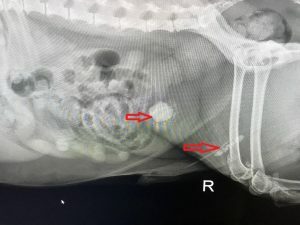 A urinalysis and x-rays were performed which showed evidence for a urinary tract infection and several urinary stones in the bladder as well as the urethra. Two types of stones were suspected based on the results, including struvite stones, which are most frequently caused by a urinary tract infection in dogs, and calcium oxalate stones, which are associated with increased calcium and oxalate in the urine and a decreased pH. 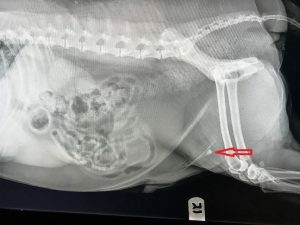 Because a partial urinary obstruction was present, surgery was scheduled for the following day. In this surgery, and incision was made into his bladder, and all of the stones were removed from both the bladder and urethra. Analysis confirmed the stones were calcium oxalate. A prescription diet and follow-up regimen was prescribed. The diet is designed to promote water intake to dilute the urine, increase pH of the urine, and restrict protein. Checking the urine pH every 3 months as well as taking x-rays every 6 months was recommended to monitor for the risk of developing more stones and to catch any new stones while they would be easily removed. Unfortunately, Roscoe was not seen for almost a year when he was presented with similar signs. This time, he had a single stone that was in his urethra. A second surgery was scheduled, and the stone was removed successfully, although with some difficulty. This case demonstrates the importance of following dietary recommendations and follow-up, as had proper follow up been maintained, Roscoe may have avoided the need for a second surgery.